Location: East of the village Litóhoro. 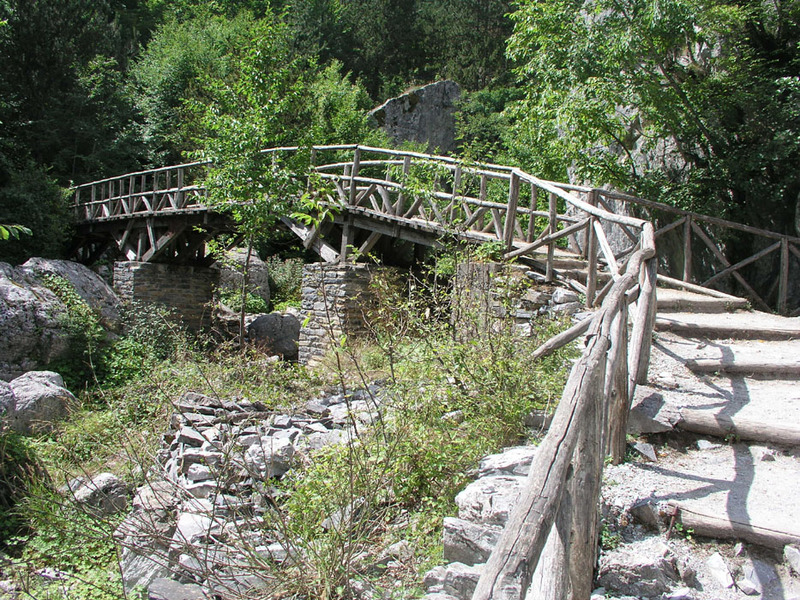 How to get there: First go to the charming village of Litóhoro. There is an exit west from Hwy. E-75 (the main road between Athens and Thessaloniki) about 90 km (south) of Thessaloniki. This village has hotels, shops and restaurants, even a store that sells topo maps of the area. The location of the town square is N40:06.261, E022:30.081 with a bit less than 300 meter of elevation. The normal trailhead is located at Prionia. The road to Prionia goes sharply left about 100 meter downhill from the village square, right if you drive up from E-75. There is a sign saying Olympos. A bit further along, this road forks, stay left as the road starts climbing. From here, it is about 15 kilometer to Prionia. It is possible that there is a fee for using this road. It looked like cars were required to stop (and pay?) when I was returning later in the day. The road first climbs, then descends quite a bit before a gentle uphill just before the parking area at Prionia. This location has elevation 1084 meter and is located at N40:05.031, E022:24.414. Route description: From the parking, head uphill through a gate (on the right side of the building) and locate a broad, well developed trail that heads a bit to the right before crossing left on a wooden bridge. The very nice trail continues next to some very large boulders before ascending a small hill where one can get a first view of the mountains higher up. You have now reached elevation 1380 meter, location N40:04.722, E022:23.661. There are a couple of benches here and (sometimes) a possible supply of water. 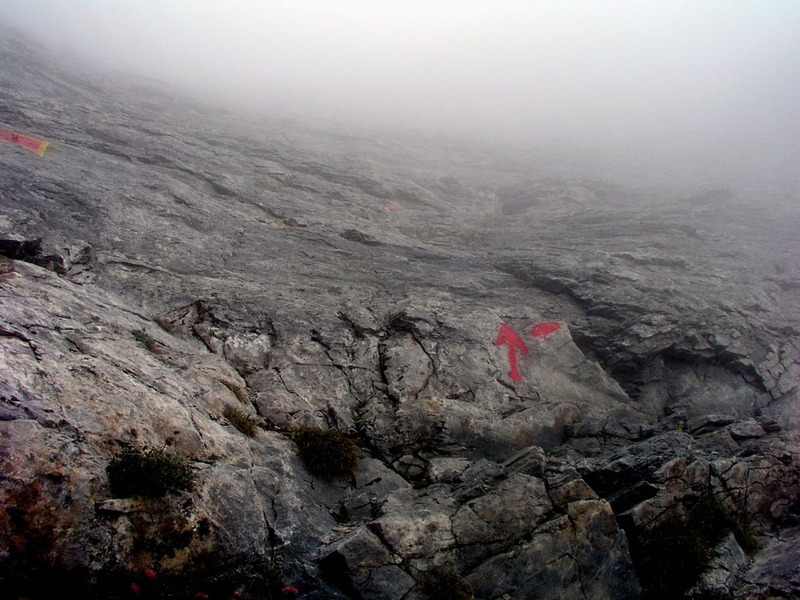 The route climbs further and eventually connects to the refuge situated on the brink of a steep step in the slope. This refuge is at elevation 2059 meter and location N40:04.805, E022:22.392, it is called Spilios Agapitos, also referred to as Refuge A. One can call ahead (+302352081899) and inquire about reservations etc. From the refuge, cross some concrete in order to locate the trail that heads out to the left of the trail coming in from below. The trail heads straight uphill, then a bit left and quickly gains a pronounced ridge that climbs westward towards a basin south of the point called Skala. From here, the route climbs a new ridge that runs (slightly west of) north to Skala, 2866 m. First, the trail stays on the west side of the ridge, higher up it gains the ridge proper. 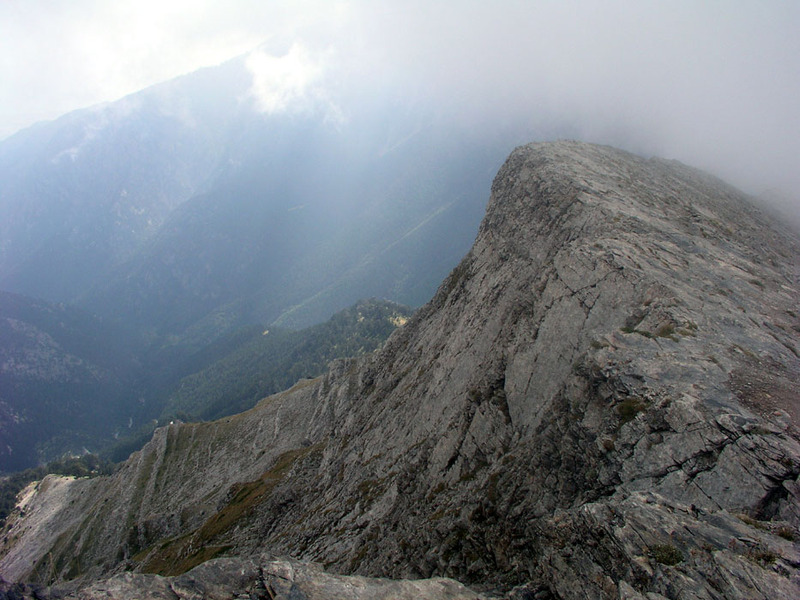 The east side of this ridge is steep, but the ridge is broad and climbs gently to Skala. Skala is located at N40:04.976, E022:21.428. Skala is between the south-west end of the summit ridge, named Skolio at 2904m and the highest point Mytikas. Skolio has a primary factor of 93 meter towards Mytikas, so would (barely) rank as a separate mountain under a 300 feet rule. 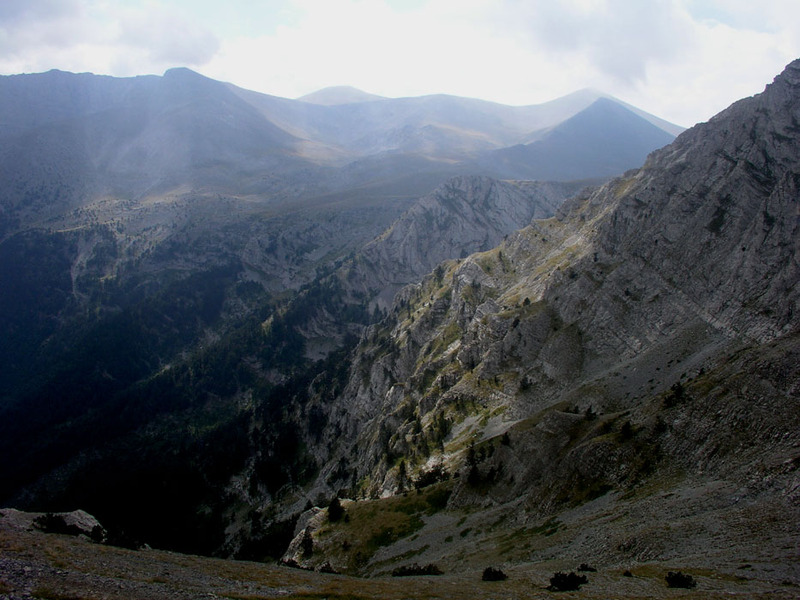 The route from Skala to Mytikas traverses the connecting ridge, mostly staying on the east (right) side, since the west slope is near vertical. This section of the route is (YDS) class 3. From Skala, the route heads down and to the left, well marked by red paint. Initially, you will see a narrow gully, descend it a couple of meter then exit to your left or just stay above it. Continue descending while traversing a bit more left. There are variations and plenty of good holds for feet and (when needed) your hands. The route levels and traverses below the ridge, eventually reaching the lowest point on the ridge at elevation 2811 meter, N40:05.052, E022:21.500. From here, after an initial small step up, the route leads into a broad gully that can be ascended, again with possible variations and many good holds. The red paint generally follows perhaps the easiest line. Crossing from left to right at the very top of this gully, the route descends along a small rib into the next notch in the main ridgeline. Going down, this may perhaps "feel" like the crux of the route, however, again the holds are good and numerous. From this deep notch, an easy scramble will complete the ridge traverse from Skala to Mytikas, the highest point of Mount Olympos. 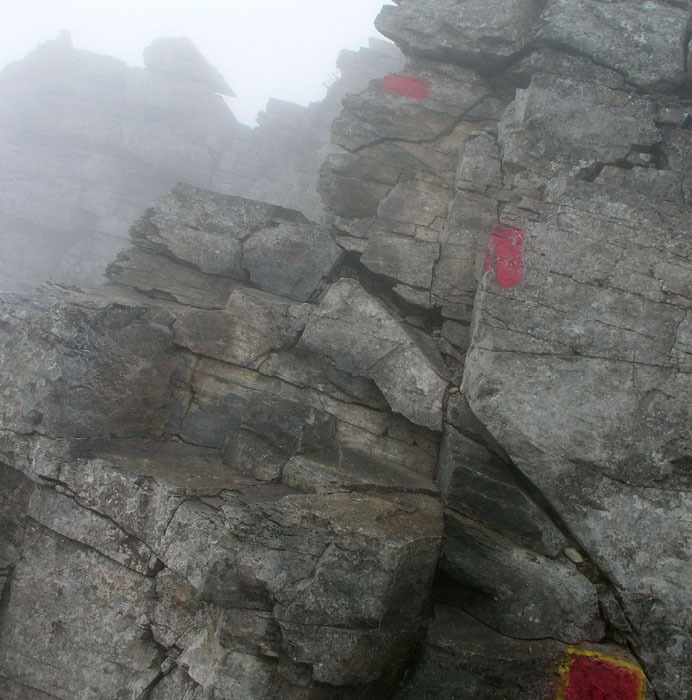 On all the steeper sections of this traverse, there were larger painted squares indicating fixed protection (bolts) that may be used for belaying in case of unfavorable conditions (ice could make this slope quite unpleasant). Comments: I came flying in from Bergen, Norway the day before. 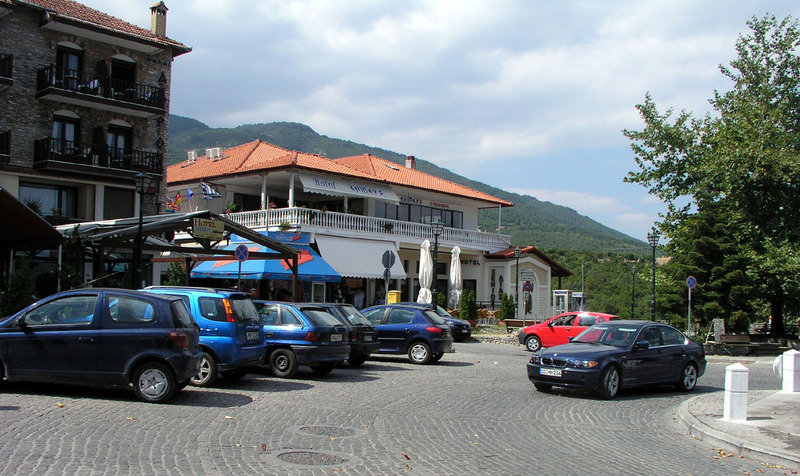 My original idea was to drive to the trailhead and hike up to the refuge that day, but delays at the airport made me reconsider and I ended up staying in a very friendly (and reasonable) hotel facing the village square in Litóhoro. I got up early and drove to the trailhead, leaving the car at 0630. After a nice morning hike I arrived at the refuge at 0815. I sat down outside and drank some water that I had carried up, when a rather unfriendly hut keeper came out and started lecturing about how this refuge was intended for people sleeping there etc. and that they required people passing by (like me) to pay Euro 1.60. This tiny amount was a strong contrast to the unfriendly lecture, I paid 2 Euros and told him to consider the 40 cents an extra contribution. He continued to report that there would be snow at the higher part of the route, this was far from correct, one would normally expect this kind of person to at least provide somewhat reliable information to climbers. It turned out that paperwork, signing in and receiving a receipt etc. was required, so my stop here took 15 minutes altogether. People had generally not started to leave from the refuge yet, and after this intermesso I continued my hike up towards Skala, arriving there 1:15 after leaving the refuge. The traverse from Skala to Mytikas took 30 minutes, it was dense fog and nobody around, so I moved rather slowly since I was unfamiliar with the route and partly also due to some very smooth and fairly slippery rocks. 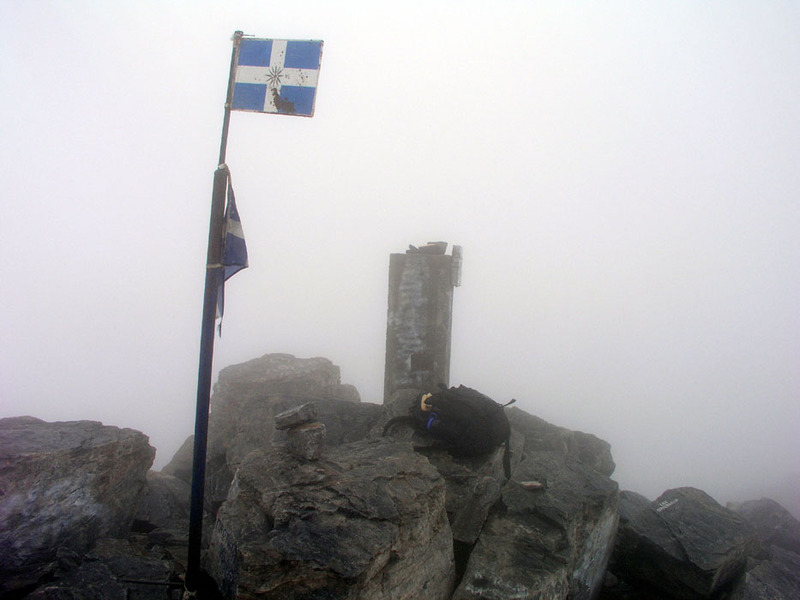 Arriving at the HP of Greece at 1015, the summit had a register that I signed and a pole with the Greek flag. I drank some more water, took photographs and looked around a bit. The fog was still dense, preventing what is likely a very nice view down the steep side (west) as well as seeing the ocean below. There was really not much more to do and I started back at 1030. I was back at the refuge at 1145, wondering if hikers were required to pay another Euro 1.60 when passing down. (This payment corresponded to the toll paid along the highway, a sort of mountain toll collection station.) It turned out that this fee only applied to hikers coming up, or essentially a one time fee. 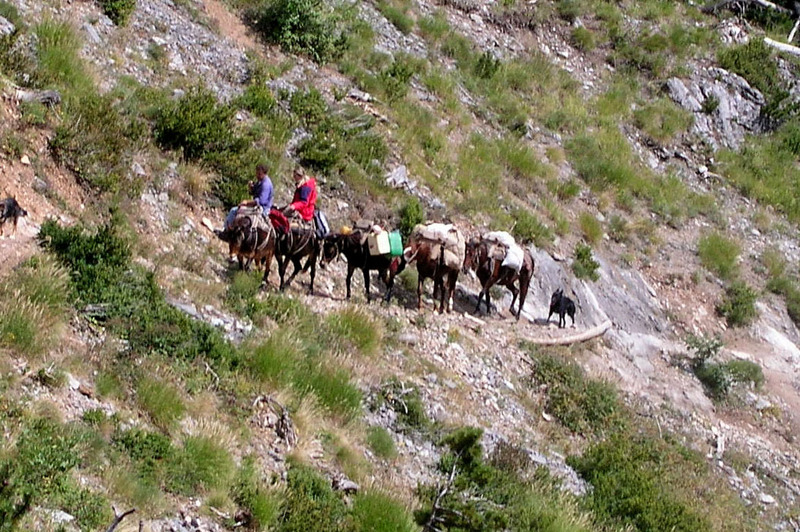 I continued down at 1200, met some mules that carried supplies to the refuge and reached the car at 1315. 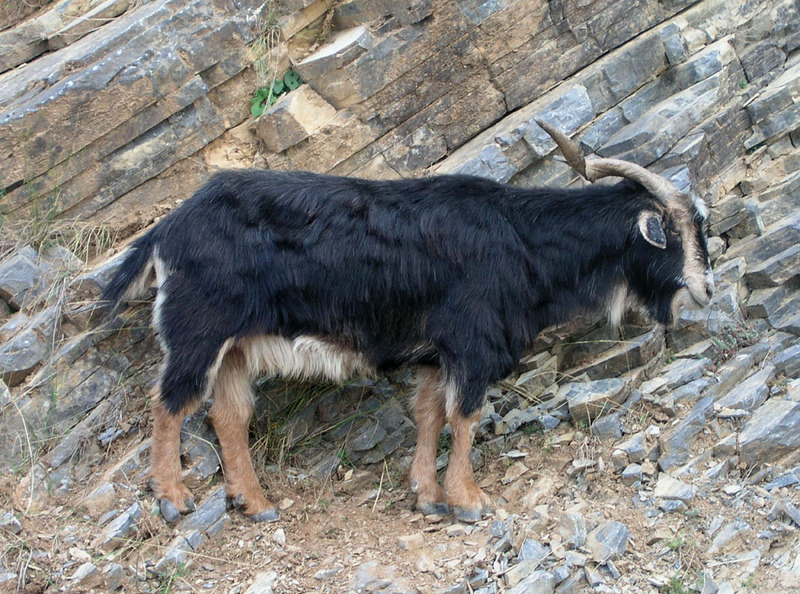 Very few people, but quite a few goats in the Greek mountains. 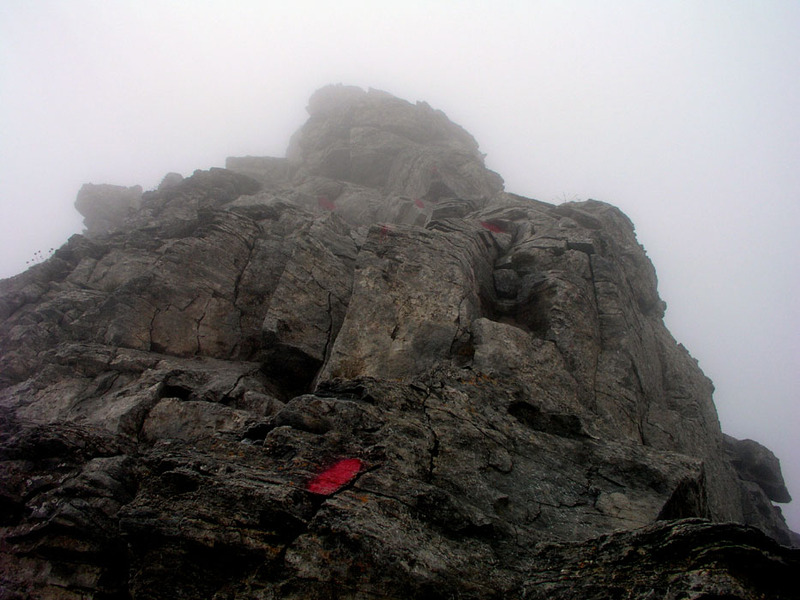 This hike involved a vertical gain of 1835 meter, the accumulated vertical being close to 2000 meter. My Greek trip continued (the same day) with a climb of Kissavos. The village square, I stayed in this hotel the night before the climb. Early morning, the trail heads up here, mostly on the right side, before traversing to the refuge that is at the end of the ridge above. Up the broad gully, this could be a bit tricky if icy. The steep section down, just before the big crack. You climb down on the way to the summit. A very deep crack in the ridge. The downclimb in order to get around this is possibly one of the more exposed points along the route. 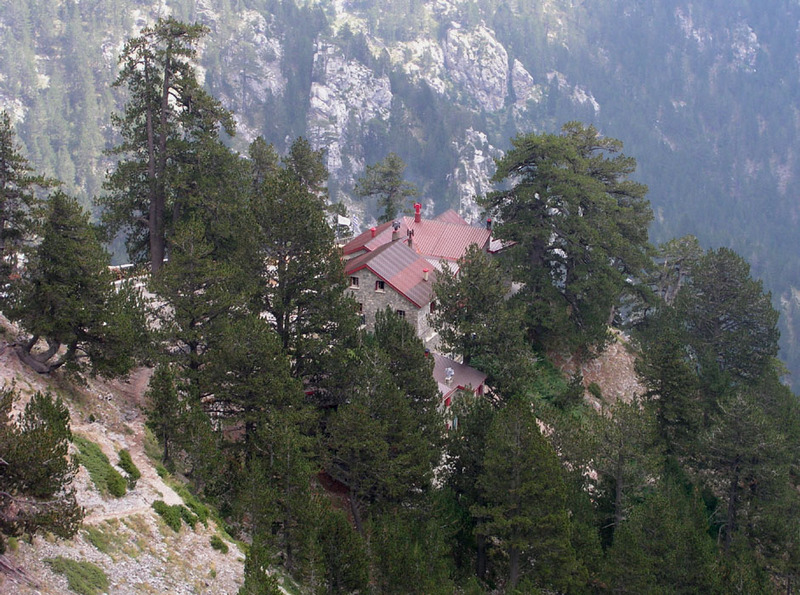 Mytikas, the summit of Olympos. Too bad with the fog. The box contains a summit register to sign. The steep section up, this picture is from the return hike. 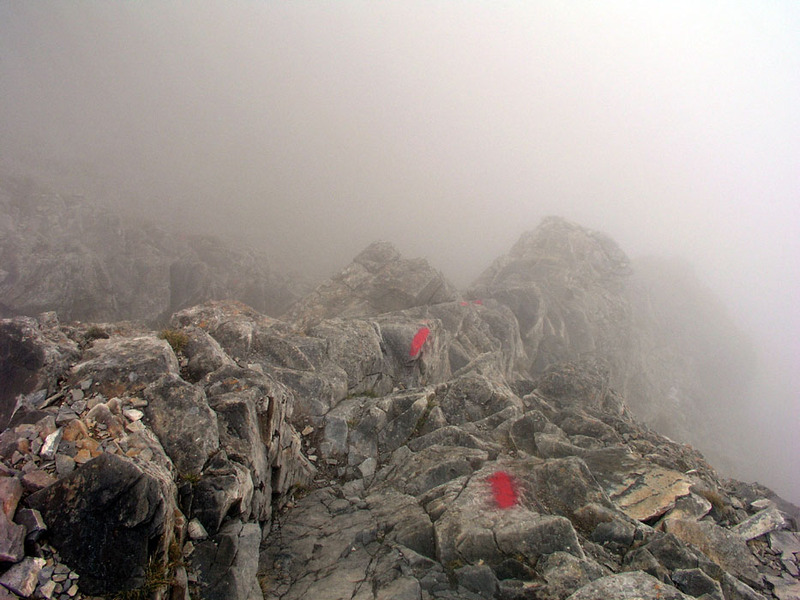 The ridge to Skala, the trail comes up on the other (right) side. 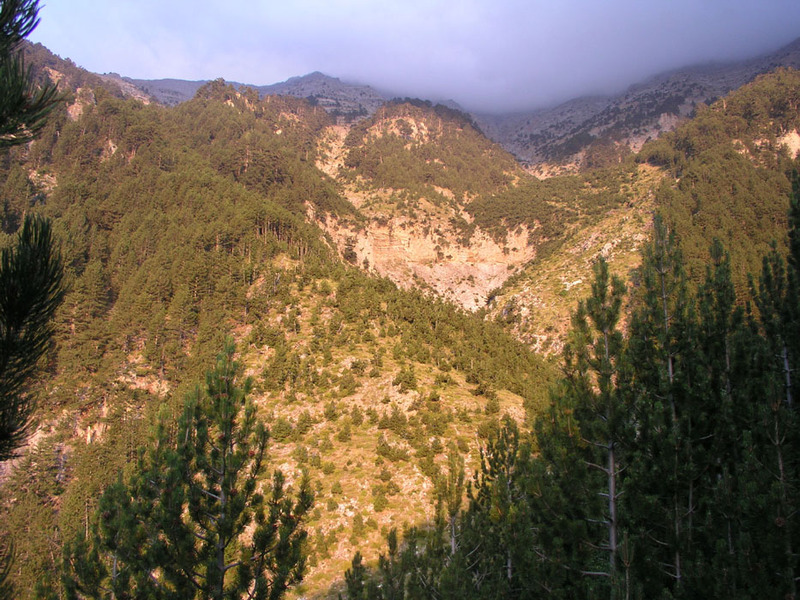 Descent from Skala, the trail goes down and to the left.